[authorbox authorid=”Melissa Cortina” ]There’s a conundrum for whole animal butchers about tenderloin: if you asked any meat-eater to name the best cut of beef, pork, or lamb, the resounding response would most likely be, “tenderloin!” But, if you posed the same question to a butcher, tenderloin is an unlikely response. Those of us behind the meat counter tend to like the flavorful, the fatty, and the lesser known cuts, while our customers on the other side of the counter prefer the quick cooking, the lean, and the familiar. So, while tenderloin is not at all my favorite cut, I understand that my customers love it and, more importantly, I consider it my duty to help them cook their tenderloin correctly. In this article, we’re speaking in particular about pork tenderloin, which constitutes less than 1% of a hog carcass. That’s a really small amount of meat! If you shop at a local whole animal butcher shop, that tiny percentage explains why your butcher may often run out of this sought-after cut. It also helps explain why pork tenderloin is perceived as special; that which is in smaller amounts is always more highly desired. Apart from its relative scarcity, pork tenderloin is also well-loved because it’s quite tender. Unlike most other cuts, tenderloin actually rests inside the rib cage, hugging the spine, and not outside where we can see it, as we could a ham or a belly. Because of its location, tenderloin is not worked in the same way as other muscles that guide the animal’s physical activities; it’s used for balance and posture rather than movement. Tenderloin remains lean because it’s used often, and stays tender because of its protected location. This very location makes tenderloin difficult to point out on a two-dimensional diagram that doesn’t adequately display the inner portion of an animal. 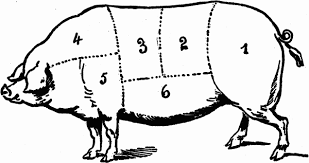 Basically, the tenderloin hugs the inside of the spine, and lies along the back half of the animal, getting thicker toward the ham. If that makes no sense to you, don’t worry about it; the most important thing is that you know how to cook your tenderloin properly. I posted a recipe here that details how to cook a pork tenderloin. As far as I’m concerned, this is always the best way to cook this particular cut (apart from grilling), and will work with any seasoning. What I want to review here, and what will take your tenderloin from mediocre to amazing, is the degree to which you cook it. Similar to beef, but to a lesser extent, pork is more succulent, juicy, and flavorful when cooked to a rosy pink on the inside. Because it’s so lean, pork tenderloin is especially prone to drying out when it’s over cooked. Don’t let that happen to you! Until about four years ago, the USDA instructed us not to cook our pork below 160 degrees Fahrenheit, due to the risk of contracting a disease called trichinosis. Since the USDA now requires pork ranchers and processers to work together to minimize the possibility of trichinosis in their finished products, the problem has largely disappeared from the U.S. pork supply. As a result, we get to cook our pork safely to a nice rosy pink! Obviously, the best way to make sure your pork tenderloin is properly cooked is to insert a meat thermometer into the thickest part of the meat, and see that it registers 145-150 degrees Fahrenheit. However, if you don’t have a thermometer, you can cut a tiny slit into the thickest part of the meat to be sure that it’s rosy, and not raw, on the inside.